Sweden joins the UN Security Council in January with the daunting task of immediately assuming its presidency. It is a time of great change and uncertainty at the United Nations with not only a new Secretary-General taking over at the same time but also a new administration in the United States that many observers fear could be hostile to the international organization. 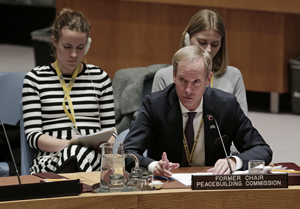 On the eve of their term, the Global Peace Operation Review’s Jim Della-Giacoma and Gizem Sucuoglu spoke with Sweden’s Permanent Representative Olof Skoog about their plans for the next two years, conflict prevention, peace operations, and how peacebuilding can fit in with the work of the Council. Jim Della-Giacoma: Your membership will start with a challenging task with the Council Presidency in January. What will Sweden’s main priorities be? Given the challenges faced by the global system and the UN, how do you plan to move these priorities forward? Ambassador Olof Skoog: We have a two-phase plan. The first phase is setting ambitions regarding our Council Presidency in January, and to successfully conclude this task. The second phase relates to what we want to achieve over our two-year membership term. Let’s start with the two-year term. I think there is a broad expectation for Sweden to be active in key horizontal issues: human rights, the implementation of the resolutions on women, peace and security, respect for international humanitarian law, peacebuilding and sustaining peace, and conflict prevention. Instead of solely organizing big debates at the Council on these thematic issues, we want to move towards a Security Council that deliver on its responsibilities and is more results oriented, inclusive and transparent in its working methods. We want to ensure that there is concrete implementation and an improved way of dealing with these horizontal issues, by bringing them into the day-to-day work of the Council. For instance, on women, peace and security, we would seek to consistently integrate this perspective in all our deliberations, bringing examples and making proposals on how to operationalize the agenda in the field. So when Mali appears on the agenda, for instance, we would like to ask about the role of women in peace negotiations, and make sure that the Council implements its commitments on this issue. January will be a challenging month, to be very honest. The working climate at the Council is not at its best; and we see that the Council is not able to take decisions in some key conflicts as a result. The UN, the international community and the Council are criticized for not taking sufficient responsibility. We have to work towards reversing this trend, starting the first of January. As a member of the Council, we would want to put conflict prevention and peacebuilding at the core of UN efforts. Preventing conflict is not only morally right; it’s also economically smart. We need a shift in mindset, to prioritize prevention, peaceful resolution of conflict and addressing root causes of conflict in our engagement. JDG: Next month will also be the first for the new UN Secretary-General António Guterres. What do see as being the impact of this change? OS: The appointment of a new Secretary-General provides a unique opportunity for a fresh approach. After all, the UN system was set up to sustain peace, and we want to help António Guterres move towards this vision. We want to re-energize the relationship between the Council and the Secretary-General’s office on prevention and reaffirm the commitment that the Council has made on sustaining peace. Beyond the day-to-day challenges regarding peacekeeping operations, the Council should be able to conduct a real analysis on what are the threats to peace in the countries on its agenda, and which instruments and tools are available to the UN system to address these threats. I would love to have a Secretary-General that comes to the Council and says: “Here are the issues on the horizon, here are my suggestions to the Council to act on these issues”. I would like to see different parts of the system, the ECOSOC or the PBC, or UNDP, UNICEF, and OCHA, to work holistically in identifying and addressing threats to peace and security. It should not only be DPKO that brings issues to the Council, but the Secretary-General, based on input from the broader system. So that’s a little bit of paradigm shift. JDG: Peace operations will be a preoccupation for both the new SG and Sweden from your first day. What urgently needs to be done to address current crises, such as UNMISS and South Sudan? At the same time, how can the Council move forward some of issues identified by the High-level Independent Panel on Peace Operations (HIPPO) such as prioritizing prevention, having better focused mandates, improving triangular cooperation, and making better use of Council field visits? OS: South Sudan is a perfect example that once the genie is out of the bottle, it is difficult to put it back in. We can talk as much as we want about prevention, but the prevention issue is not on the table when it comes to issues such as Syria. For some of the worst conflicts right now, the most important first step is about finding a new unity within the Council for it to act. Syria is also proof of the importance of finding political solutions to conflict, as military solutions do not work. We have to think what can we do now to promote political process in South Sudan, and how to ensure the Council is united on this. As a member of the Council, we would want to put conflict prevention and peacebuilding at the core of UN efforts. In South Sudan, we need to talk about the possibility of a genocide happening. Peacekeeping as a Band-Aid solution in war-torn countries is not going to work; this is exactly what we see in UNMISS in South Sudan. Someone has to come and say that the peacekeeping operation is not strong enough or robust enough or efficient enough in a way to protect civilians. I can also understand the UN’s limitation here about turning that kind of very difficult information into a coherent and practicable plan for action. To move forward, we need more coherent input from the SG from the ground, in terms of what his system sees as a whole and thinks as a suggested way forward. We need peacekeeping with political mandates, empowered to do the necessary work to find (or underpin) solutions to conflict and bed for the possibility of sustained peace. Again, the onus is on the Council but also the Secretariat and the troop contributing countries (TCCs). The triangular cooperation you mention can happen both informally and formally, the most important is that there is a joint vision as regards the mandate and what the UN ultimately is there to do – resolve conflict and keep the peace. One other lesson from contexts such as the DRC is that when things are not going well in a country, even when there is road-trip diplomacy, it is difficult to ensure practical outputs from the Council, even in the form of presidential statements. Of course, there are different views on how these statements can change the situation on the ground, but at least the mediators on the ground know that there is a united Council behind them. In January, we want to start looking into the possibility of the Secretary-General giving more detailed information from the ground to the Council, as well as options to move forward. Worrisome trends can also be discussed discreetly, in more private settings. Through these informal meetings, the Council can identify the most credible actors to work with in advance, such as the African Union and the European Union. JDG: 2015 was a year of big reviews and processes: The reports from the HIPPO and the Advisory Group of Experts (AGE) on the UN’s Peacebuilding Architecture. There was also the Global Study on the Implementation of UNSC resolution 1325. During your two years on the Council, how do you plan to move forward some of the ideas and recommendations in these reviews? OS: The Women, Peace and Security agenda is a top priority for me and for my Government. We now have a solid normative framework, but implementation and follow-up is lacking. As member of the Council, we would seek to consistently integrate this perspective in all our deliberations, bringing examples and making proposals on how to operationalize the agenda in the field. I think all the reviews and processes of 2015 make it clear that the system is working in silos. They also emphasize that there is too much faith in military solutions to what are essentially political problems. For us, we see the need to reverse the thinking towards the primacy of diplomacy, and the primacy of politics, detecting crisis before they erupt. We need to make sure there is a connection between peace and security and development and human rights. This is one of big conclusions from both the AGE and HIPPO reports. And they are very coherent, the three of them fit together nicely in the innovations they suggests. Gizem Sucuoglu: Sweden was a key actor during the peacebuilding review, and has assumed several positions at the PBC, most recently the Chair of the PBC Liberia Configuration and the Chair of the PBC. What do you see as the biggest opportunities brought forward by the sustaining peace concept, the AGE report, and the sustaining peace resolutions? Which opportunities do you see as the best ones for taking forward this agenda in the Council in a concrete way? OS: I think the resolution on peacebuilding is a commitment to a paradigm shift, for the UN system to act in a more holistic manner and to place prevention or sustaining peace at the core of what this organization should be about. The Council has committed to the agenda through its Resolution 2282. For me, sustaining peace can be seen as an instrument to get better information to the Council, deriving information in a holistic manner from different parts of the system. 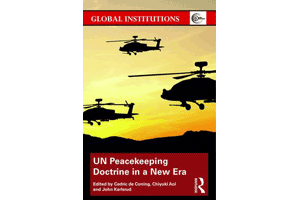 It also stipulates that the UN system works more holistically than in the past, accepting that, in essence, everything that the UN system does on the ground relates to upholding and sustaining peace. From this angle, there is nothing disturbing with bringing the UNDP perspectives, for example, to the Council, in relevant situations. The UN is sensationally well represented globally through its field missions and has access to important information. The whole system should to be able to analyze and use this information, and work in holistic way based on joint strategic analysis. This idea is very important. The implementation is of course difficult, but at least I think it helps break down the barriers where countries used to say ‘hang on, prevention is not part of the book’. It’s clear that this is no longer true. I think we have broken down these walls with these resolutions and I think that’s very crucial. GS: Sweden has played a key role as the Chair of Liberia configuration. You have worked to improve the PBC’s relationship with the Security Council. Liberia is now transitioning from a Security Council mandate and the challenge is to find holistic responses together with the UN country team. Can you tell us more about how Sweden has focused on fostering these holistic responses, including through a stakeholders forum it put together in Monrovia? OS: In Liberia, we have made special efforts to contribute in our advisory role. In my capacity as chair of the configuration, I travelled to Monrovia in October to consult a wide range of stakeholders in Liberia to identify peacebuilding priorities during the upcoming transition and beyond the peacekeeping presence in the country. A primary objective of the trip was to co-host the Multi-Stakeholder Forum on “Sustaining Peace through Transition in Liberia” together with the Government of Liberia. The Forum sought to deliberate on the longer-term peacebuilding needs in light of the Security Council’s upcoming decision on the future UN presence in the country. Throughout the visit in Liberia, two questions were at the forefront of the deliberations: “What must be done to address remaining root causes of conflict in Liberia?” and “What should UN support look like after UNMIL?” The outcomes and recommendations of the visit have been put forward to the UNSC, in the form of a trip report, a briefing at the formal meeting of the UNSC last week, as well as through an informal consultation at the expert level between the Chair of the configuration and UNSC members. The stakeholders forum was very successful, a prime example of having the government and national stakeholders owning peacebuilding processes and engaging with the UN system. We were very well received by the government and had excellent bilateral meetings. This helped making the Council interested in hearing our conclusions from the trip. GS: And, so far, how have the UN Security Council and PBC worked together on Liberia? On substance, our concern in Liberia is that the peacebuilding agenda has not been sufficiently advanced, despite many years of UNMIL presence. There are important outstanding elements on reform agenda that has not been implemented. Our concern is, if the security presence pulls back too early, there might be repercussions that the Council should consider. This has ben the core of our discussion with the Council. The relationship between the PBC and the Council is far from ideal. The peacebuilding commission is unique in its working methods, because it can actually work with countries and meet with different stakeholders from the countries on its agenda. This sort of working method is lacking in the way the Council works. However, the PBC will never be completely relevant, if the Council is not ready to take on its advice or listen to it, even if it is not exactly what every member of the Council wants to hear. The PBC should be allowed to bring a fresh perspective into deliberations. I think there needs to more readiness and openness from the Council, including permanent members in particular, to listen to the advice from the PBC, so there is room for improvement. JDG: I remember being in Liberia in 2003 to 2005 when Swedish troops were participating in UNMIL as members of the rapid response force. Looking back now at Liberia using your peacebuilding lens, how would you evaluate the UN’s role overall? OS: I haven’t seen Liberia when you were there. I was there at the end of the 90’s, probably a much worse time. To answer your question, probably yes and no; I have mixed feelings. I have no doubt that the contributions of peacekeeping operation have been huge, I don’t see a huge risk for this country falling back to the kind of conflict we have seen fourteen years ago. That’s already a huge achievement. We are soon to have another set of elections; with high hopes for a peaceful transition from one elected President to another. These are big achievements, compared to the devastation thirteen years ago. This is all despite the bad economic situation in that part of the world, falling prices of raw materials, and Ebola. Having said that, I still wonder, how much better it could have been, if the peacebuilding agenda had been more prominent from the outset. What if we had more coordinated international support from the beginning, including from donors such as my own country, working with the Americans and the EU and other big players, to ensure that there is one coordinated message about what we want and expect the government to do in terms of reconciliation, land reform and similar reforms. I do believe we need the mission to stay on for a while, but I also think there could have been much more work done on the peacebuilding agenda over the years. Given the amount money and human resources invested in peacekeeping, I’m still concerned about the lack of economic development, the many outstanding issues in Liberia. For instance, 63 per cent of the kids still do not go to school, despite some years of pretty good economic development. JDG: Now that you are going to be the Council President, do you have plans to change the way the Council and the PBC relate to each other? How do you plan to interact with the PBC as President? How will you encourage other members of the Council to do so? OS: I think there isn’t any way around this right now. If you are a chair of configuration, you are invited to brief the Council, in accordance with what has been agreed by the entire PBC membership. Of course, you can also make use of that opportunity to additionally offer your personal account as the PBC Chair. This way, the Council will hear what you really think. I think, as a Council member, we can work together with other countries that are keen to improve the way we deal with peacebuilding more broadly. The approach on women, peace and security that I have mentioned earlier could provide a model. When the time for briefing on a country situation arrives, with input coming to the Council from the secretariat, there is need to put out control questions: ‘Hang on…What is the UN system doing to ensure the effectiveness of the peacebuilding components of the mandates in Libya or Côte d’Ivoire?’. 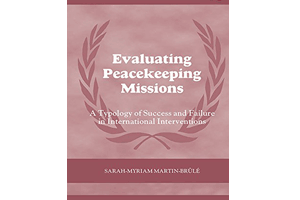 This will ensure looking beyond the DPKO brief, that highlights the immediate current challenges for the mission, and looking for broader information on the whole peacebuilding agenda. We are already talking to other members of the Council to ensure this kind of an approach.